Please join me for some Italian & Mediterranean fun in the kitchen in Nashville TN! We’ll explore all the delicious regions of Italy and sometimes cook up cuisines from other cultures along the Mediterranean with hands-on cooking. Spring 2019 schedule has sold out. Summer 2019 schedule will be out in May and emailed to my announcement list. If you’d like to be added to the list please send me an email. Gift Certificates are available. If I get a cancellation I will post on my Chef Paulette Facebook page. Events are $70 each per person and take place in Bellevue. Paulette Licitra cooks, writes, sings, and paints. She completed her professional culinary studies at the Institute of Culinary Education (ICE) in NYC and cooked in Mario Batali’s restaurant Lupa. 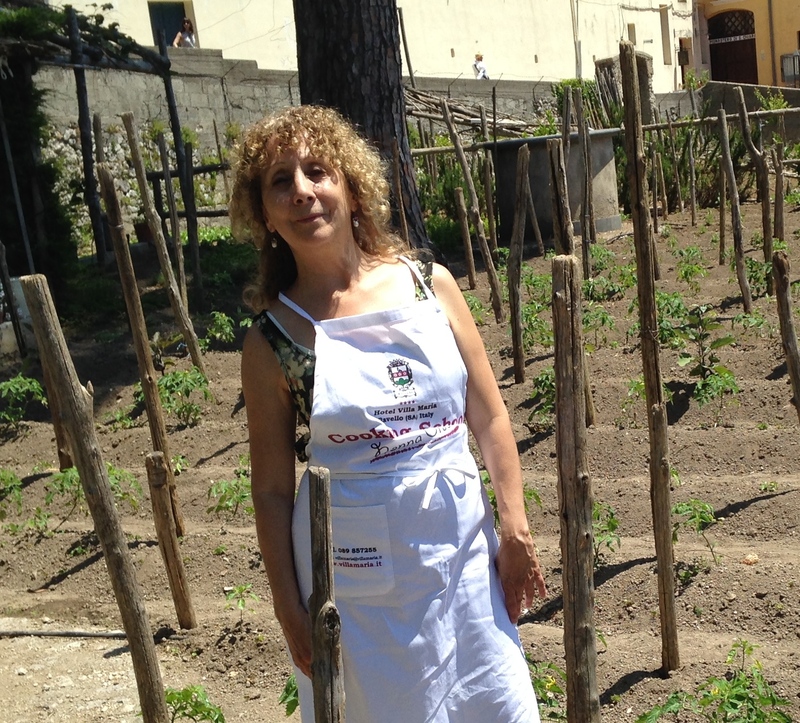 Paulette has traveled extensively in Italy for culinary research, and studied with home cooks in Lazio, Liguria, Emilia-Romagna, Lombardia, Campania, and the Veneto. She teaches Italian cooking classes in Nashville and cooks frequently on Channel 4 WSMV’s Today in Nashville. She is the publisher of the literary food journal Alimentum, and performs music in the band Duette with Duane Spencer. For paintings by Paulette, check the Artwork tab on this website. Hi Chef Paulette. Very interested in being added to your email list so I can see your upcoming events for the spring. I’ve been saying for three years now I wanted to take a cooking class and have yet to do so. Hey Lauren, send me your email address so I can add you to my announcement list. Thanks! Please add me to you email list for classes…..I’m going to ask my kids to get me a certificate for one of your marvelous classes for Christmas. Cindy, sorry I may have missed this message. Did we set up your email with my list? Thanks! Hello, I’m interested in an upcoming cooking class or my daughter and I who like to cook. Would you put me on your email list. Thanks, Don. Send me your email address and I’ll add it. Thanks! Will you please add me to your email list? My wife and I would love to take one of your classes. We do not have Facebook and do not want to miss a chance to attend a class! Thanks, Rusty. Please send me your email address to: chefpaulettemedia(at)gmail(dot)com Would love to add you to my list! Hi Chef, Here is my contact information. My wife and I will be visiting Italy this coming fall for two weeks. We would love to attend a few classes if you have room leading up to that time in 2018. Look forward to hearing from you! I would love to be added to your email list. Looking forward to signing up for one of your classes! Hi There, Laura…just get me your email address and I’ll add you to my announcement list. Thanks! Will you please add me to your email list? My son and I would love to take one of your classes. Thanks! Hey Jodi, just send me your email address…thanks! Hello, would love to sign up for the next class you are offering. Do you ever have classes that focus on desserts? Hi Wes, classes are full dinner menus — not just dessert, but includes a dessert. Classes are sold out thru beginning of April. New schedule will come out in February for the spring and send by email. If you like give me your email address and I’ll add it to the announcement list. Thanks! Hi! I am interested in a pizza making class. Specifically, dough making & how to stretch it. Also, how to make homemade pizza sauce. Do you offer any classes like this? Hey Ashleigh, from time to time I do pizza-making classes but not all the time. (Includes the sauce & toppings!) if you’d like to get my class schedules send me your email address and I’ll add you to the list. Next schedule will be spring — announced in February. Thanks! Hello! I’m looking for information to attend a cooking class wit 5 other girls as a “bachelorette” party before a wedding! Dec 22 is the date. Pleaselet me know your availability! Hi Rebecca, I got your email — will write back. Thanks! Hi, please add me to the email list. I would love to learn from you and to take my girlfriend along with me! Hi Schuyler, Will do! Just send me your email address. Thanks so much! Please add me to your email announcements. Would love to take a class in 2018. Love your segments on Today Nashville. Thanks so much, Karen. I’d love to add you to my email list — send me your address. Thanks again! I am very interested in a cooking class in Sept/October – I hope you are not sold out yet!!! Can you add me to your mailing list please: angiebond07@gmail.com. When does those class dates for the fall come out? Thank you for your time…..
Hi Angie, I’ll add your name to my email announcement list. This fall I’m not putting out a schedule because I’m traveling to Italy and have many private cooking parties booked. A new class schedule will come out in November for the Jan-March calendar. Thanks so much! I know your booked up for summer 2017 but I would love to be added so when your next classes open up I can surprise my husband. I’ll add your name to my email announcement list — thanks so much, Maggie! Please add me to your email. I am interested in your class information. Would love to, Donna, thanks! Your email is not showing up in the message. Send to me: at ChefPauletteMedia(at)gmail(dot)com…thanks! Thanks for your note! My summer schedule will be out in a week or so, I’m just working on it now — I may have a class on the 29th but can’t promise there will be 4 spots available. And to be fair, I can’t reserve before I send it out to my whole list. Hope that makes sense…thanks again! Hello!My husband & I are celebrating our anniversary in Nashville this year and would love to participate in one of your classes.We’ll be there June 19-22nd. Hi Ashley, thanks so much for getting in touch! I’m sorry to say that those dates are all booked for me. Hope it can work out next time. Happy Anniversary! Hi- just read an article in the winter issue on local table about a culinary tour of Nolensville Road. Will you be offering those this year? I’d like to be put on your emailing list regarding upcoming classes and these food tours. Thanks! Will do, Betsy! Please send me your email address. Thanks so much! I was wondering if there are any classes available either Friday or Saturday in April? I know they are all sold out for March. If so, I would love to be placed on the email list. Hi Kyle, thanks for your note. Classes are sold out thru the end of June — the summer schedule will be out in May. If you want to be on the email list, just send me your email address. Thanks! Hi Ashlly, No, I don’t do classes on Sundays — I do on some Saturdays. ButI’m booked up thru the end of March. New spring schedule comes out tomorrow – but I’d need your email address. Thanks! Interested in attending classes. Please forward the Spring schedule. Let me know your email address, Cindy, and I’ll add you to my announcement list. Thanks so much! Paulette, my daughter and I will be in Nashville the weekend of Jan 13th. Will you be having any cooking classes that weekend and if so, could I get some information on them please? Thanks so much! I know you probably get a TON of emails so I’ll keep this short. I am launching a new post on my blog next week. It will focus on best things to do in Venice. Specifically I would like to link to best blog posts about certain locations in Venice ( I would also like to include link to your post about La Zucca ). Would love to share it with you when it is finished if you’re interested… do you mind if I send you a link? Hi Denise, So happy you’ll be trying the cookie! Yes, 2 tablespoons is correct (I know it seems like a lot more than the usual). The vanilla flavor comes through nicely in the cookie. Thank you! Let me know how they turn out. Hello Chef Paulette, I would love to have you come to my home for a private cooking session with my family (total of 6 people) to teach us how to cook eggplant and perhaps something else vegetarian. My son is away at college, but will be home for Christmas. He recently attempted to cook his own Thanksgiving meal of eggplant by himself while away at school and had to throw everything in the trash. He ate Jack n the Box Thanksgiving. HELP. He will be home for the Christmas time period. My husband and I are interested in classes. Can you send me the Winter schedule? Hi Denise! Thanks for your note. My Winter schedule went out last week and everything is sold out now thru March. In March my spring schedule will come out via email announcement. Would you like me to add you to my email list? Thanks again! be back to you soon, Mary! Yes, Mary, will get back to you soon…lots of requests came in to organize! Thank you! Please add me to your email list for new and available classes. Thank you! Hi Jenny! Just answered your other note and was wandering if you’re on my list. I will add you and will send you more detailed info about gift certificates…Thanks! I am wondering how I can get on your email list to be notified when new classes are available? I will add you to the list! Beginning or Mid-November I’ll send out my schedule for Winter Jan-March 2016. Thanks! Would love to be added to your email list Chef Paulette. Thanks. Please add me to your cooking class email list. Love your Channel 4 segments!! Interested in Winter classes !! Please add me to your email list!! thanks so much, Terry! great to hear from you. I’ll add your email address to my announcement list. do note that classes can sell out fast. Thanks again! I would love to get in your next open cooking classes. When will you post your next ones for us to sign up? Hi Kelly, the fall classes are sold out, but the winter schedule will be out beginning of December or sooner — I’ll add you to my email announcement list. Thanks! Hi Sherry, thanks for your note. The Fall classes are sold out, but the Winter schedule will be out at the beginning of December or sooner. I’ll add you to my email announcement list. Thanks! Hi Cassie, You may not be on the mailing list. I’ll be sure to add your name. Summer and Fall classes are basically sold out. In December there will be a notice for winter classes. Thanks! Please add me to your email list. I’m very interested in your next round of classes! will do, thank you, Olivia!